Existing-home sales were down 7.1 percent to a seasonally adjusted rate of 5.08 million in February. Despite the month-over-month decline in February 2016, the numbers are up 2.2 percent year-over-year from February 2015. NAR's chief economist, Lawrence Yun, says the decline reflects buyer anxiety about the economy and the increasing difficultly in finding affordable housing. The National Association of Realtors existing-home sales report reflects would-be buyers anxiety about the cost of living and the overall state of the economy. According to the report, total existing-home sales, which are completed transactions that include single-family homes, townhomes, condominiums and co-ops, dropped 7.1 percent to a seasonally adjusted annual rate of 5.08 million in February compared to 5.47 million in January. @REALTORS: existing-home sales dropped 7.1% to a seasonally adj. annual rate of 5.08M in February. However, sales in February 2016 were still 2.2 percent higher than sales in February 2015 — so despite the dip, the February market is not dire. Single-family home sales were hit the hardest, declining 7.2 percent to a seasonally adjusted rate of 4.51 million in February from 4.86 million in January. Condominium and co-op sales suffered as well with a 6.6 percent decline to a seasonally adjusted rate of 570,000 in February compared to 610,000 in the previous month. Despite the February sales decline, the overall existing-home sales numbers are still 2.2 percent higher than last year’s numbers. “Sales took a considerable step back in most of the country last month, and especially in the Northeast and Midwest. The lull in contract signings in January from the large East Coast blizzard, along with the slump in the stock market, may have played a role in February’s lack of closings,” said Lawrence Yun, NAR’s chief economist, in the announcement. 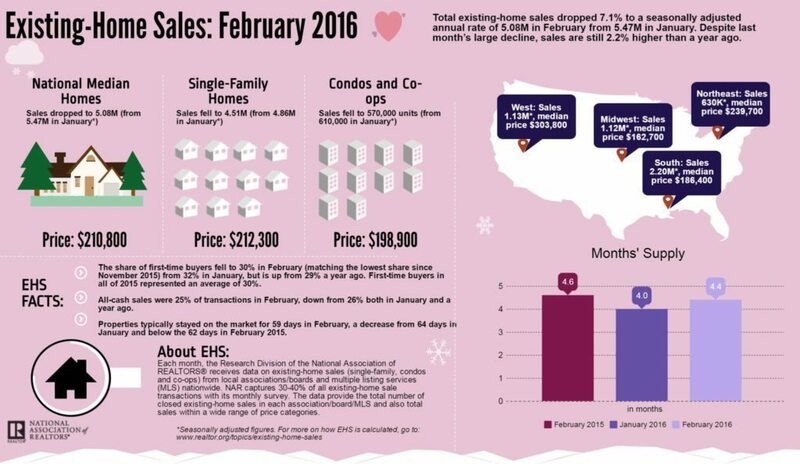 The median existing-home price for all housing types in February was $210,800, up 4.4 percent from February 2015’s $201,900. Furthermore, the existing-home price increase is the 48th consecutive month of year-over-year gains. Lastly, the share of first-time buyers dropped 30 percent in February from 32 percent in January, which matches the lowest share since November 2015. Despite the disappointing numbers, NAR president Tom Salomone says buyers need to dig in rather than give up on the homebuying process. @REALTORS: Buyers need to dig in and use a Realtor to help them find an affordable home.